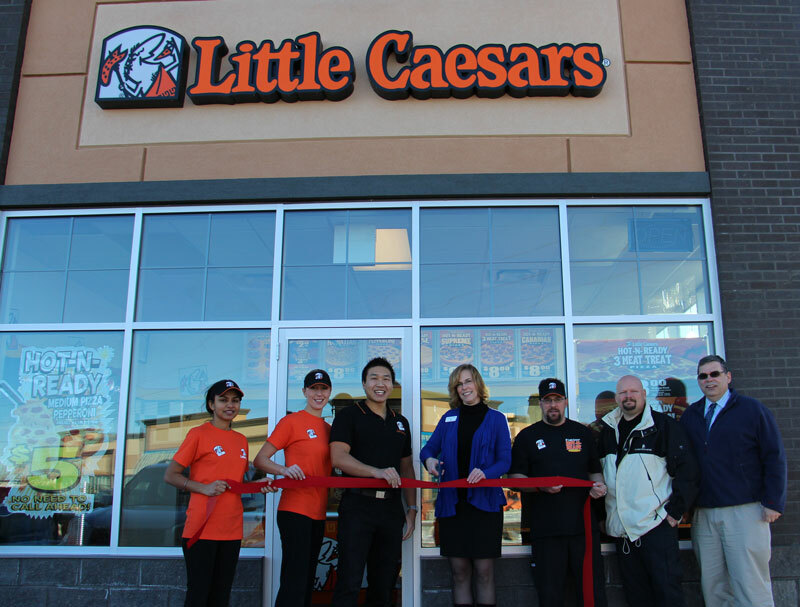 CHESTERMERE – Little Caesars Pizza was founded over 50 years ago in Garden City, Michigan and January 8th marked the Grand Opening of the Little Caesars Pizza right here in Chestermere. Now perhaps you are thinking doesn’t Chestermere have enough pizza places already? Well the owner of the Chestermere franchise, Howard Lima, says “No way”. He believes Little Caesars Pizza is unique and there is plenty of room for everyone to do well in Chestermere. In fact, Little Caesars Pizza is not just another pizza place. No sir, it`s unique in that you don’t pre-order your pizza; all you do is pop by and pick it up. It is HOT-N-READY when you arrive. There are 7 types of pizza available including a Vegetarian and they are always fresh from the oven. From freshly shredded cheese to each and every topping, their pizzas always have the freshest ingredients. “We definitely have the best service and best value when you can walk in and pick up lunch or dinner at a reasonable price”; we’re there for the value eater” says Lima. Not only do they offer a wide variety of pizzas but also have wings in 7 different flavours and their famously addictive “Crazy Bread”. As well there are several types of “dippers” for the Bread and all kinds of soft drinks to enjoy. One of the features not found at other franchise outlets is a small bistro style counter if you would rather sit inside and chow down if the outside elements aren’t favourable. Lima employs 24 local residents at this store. It is amazing how many people need to be employed to run an operation such as this but Lima hires a number of students and makes sure that school comes before work; a good work/life balance is essential. 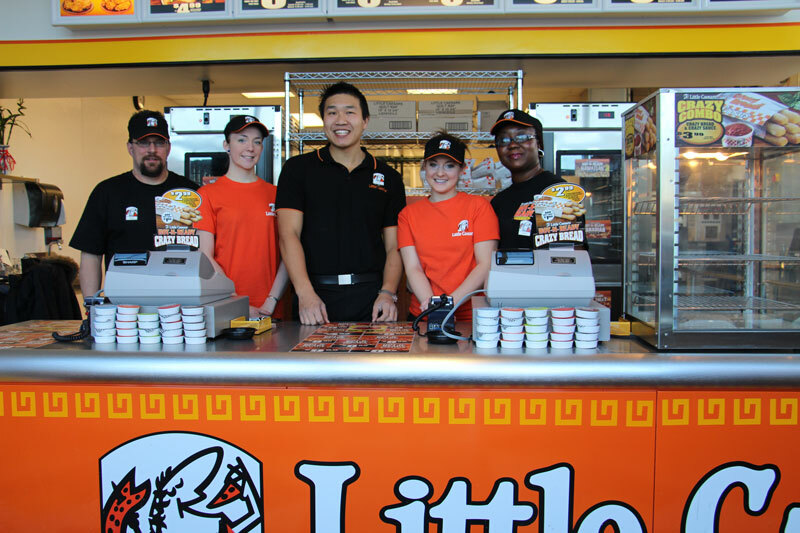 Lima also makes sure they are enjoying what they are doing and says having fun at work is a big part of the job at Little Caesars Pizza. This process may seem rather elementary for some but for others it’s fascinating. Each pizza dough batch is made fresh and is measured to the exact weight by the dough master himself Romeo Maisonneuve who has tons of experience in the hospitality business. Actually one of the secrets to perfect pizza dough is allowing it to rise a specified time before rolling it out into a pizza pan he tells me. (I’m sure if you’re a baker you already knew that). Like an assembly line process the dough is then passed on to Angela Dimiri who rolls it out and then massages the dough into a pan, then passes it on again where all of the fresh ingredients and toppings are added by Hannah Christine. The day starts early for these folks so they’re prepared for the rush at noon or at dinner. There needs to be a constant supply of pizzas that are held on a rack until needed. From there they are put into a state-of-the-art oven where the pizzas are baked to perfection. The HOT-N-READY Wings and Crazy Bread are also cooked in the same oven but the conveyor moves at a different rate of speed than the pizzas. It’s interesting to see how an operation will run with precision if you have all of the right staff and procedures in place; with 50 years of experience you can bet they know how to turn out a quality product. Lima uses the projection data to determine how many pizzas the store will need for each and every day and until he’s able to determine that better, he tells me the Calgary Drop In Centre get to see him regularly. Little Caesars Pizza is located at 103, 100 Marina Drive, across from the CIBC. They are open daily at 11:00 AM and close at 10:00 PM weekdays; Friday and Saturday they close at 11:00 PM. Their phone number is 403-272-5545.